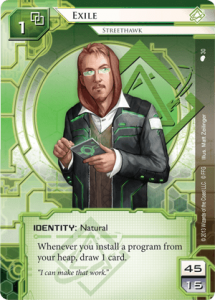 Hello and welcome back to Deckspace, where we discuss offbeat Netrunner deck concepts. Each week I’ll try to alternate between Runner and Corp, as well as try to give each faction equal time in the spotlight. Today we’ll be looking at a Shaper deck, a truly unique concoction that aims to use Exile’s identity ability to its maximum. I just have to import 12 Anarch cards, see? I won’t blame you if you don’t catch it right away; I certainly didn’t. 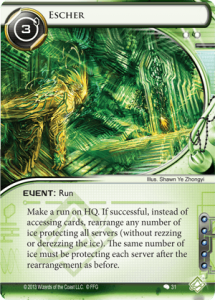 Once Scheherazade and Deep Red are both in play, you can install a Pawn on Scheherazade (netting 1 credit) and immediately move it off to be hosted on a piece of Ice protecting a central server. Pawn is the only Caïssa that allows this; Knight, Rook and Bishop all have rulings that disallow moving once hosted on Scheherazade. Now, when Pawn reaches the end of a column of Ice, it is “promoted” into the Caïssa of your choice, usually installing from your heap. While you can’t use this to reinstall the same Pawn due to the card’s wording, there is nothing preventing you from installing another Pawn that was previously trashed, immediately netting a card draw from Exile’s ability and a credit from installing on Scheherazade, as well as immediately moving off to be hosted on a piece of Ice for free thanks to Deep Red. The upshot of all this is that every time one of your Pawns gets “promoted” into another Pawn, you net a card and a credit. 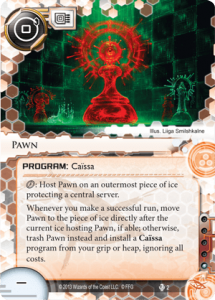 If there’s a central server protected by a single piece of Ice, every run you make will trigger a Pawn promotion. If you have all three Pawns active (two installed and one in your heap) each successful run you make will net two cards and two credits. Once you finish explaining all this to your opponent, your runs will result in overwhelming click efficiency, netting five actions for the price of a click. Before we go any further, let’s look at a decklist. There’s a lot going on here; this deck is packed to the gills with situational one-ofs. There is fierce competition for each deck slot, and cutting it down to 45 was not easy. This deck has a lot of moving parts, and while playing you’ll find you always have a lot of options at your disposal. Your mulligan decision is usually easy: keep any hands that have Deep Red, mulligan any hands that don’t have it. Your game plan cannot get off the ground without Deep Red, and you have no ways to search for it. All your other combo pieces can be searched out by Self-modifying Code and Test Run. The first thing you want to do, as with most Runner decks, is play a Sure Gamble and face-check some Ice, hoping to gain free accesses or slow the Corp down by rezzing Ice. It would be mistake to start building up to your combo right away; if the Corp is stumbling, it is your job to capitalize on that, no matter what deck you are playing. As always, use your judgment when face-checking Ice; if you suspect Komainu, having SMC ready to fetch up Deus X may be a good idea. You might consider a turn 1 Datasucker to build up counters early; this can be a strong play, but you also open yourself up to Destroyers. Losing a single Datasucker is not the end of the world given how much redundancy we pack, so don’t lose sleep over it. If the Corp is unable to rez, punish them with Dirty Laundry or Indexing. At least I’m never splashed, right? Once the window for early aggression has closed (or become uneconomical) you should attempt to build up to highly efficient runs. Finding Scheherazade is priority #1. Given that we run a single copy, it’s a foregone conclusion that the first SMC will have to become a Scheherazade, although you should delay that until you absolutely must install your first program. To get the combo started, you need Scheherazade, Deep Red and two Pawns. Pawns can be substituted with Test Runs or SMCs, and Scheherazade will usually need to be SMCed out. 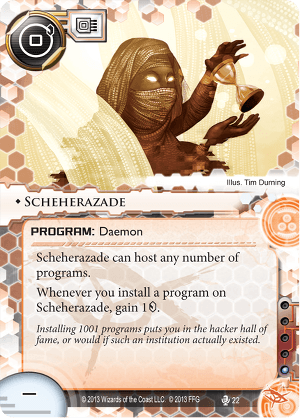 Please do not Test Run for Scheherazade. As miserable as it might feel to Test Run out a Pawn, it’s not that bad; you’ll install it on Scheherazade, making the Test Run cost only two. Deep Red will then move the Pawn onto Ice, ready to be promoted. Once the Test Run’d Pawn is promoted away, Test Run will lose track of it and thus will not return it to your stack. Dig for these four pieces, playing out Sure Gambles, Daily Casts and Dirty Laundries as you go whenever possible. Try to avoid discarding useful cards; Mem Chips and Clone Chips can be installed cheaply to make room in your hand, Parasite can be placed to slowly chew through some Ice and low-cost programs can be placed on Scheherazade while you dig. Redundant copies of Deep Red can be trashed if you don’t expect hardware destruction. Deus X can be trashed if you don’t expect it to have value in the matchup. Femme Fatale can be trashed as you can’t Test Run it from your Grip, but you can Test Run it from your Heap (netting a card in the process). Even if you don’t expect to use Inti or Sharpshooter, you should install them anyways; you’ll trigger Scheherazade and Scavenge them away later to get back a Parasite. Yes, this card has uses that don’t involve Test Run and Femme Fatale! Note that even while digging, you should be pressuring the corp wherever possible. Not allowing the Corp to run away with the game is more important than assembling your combo. If there’s an active Sundew, go kill it. 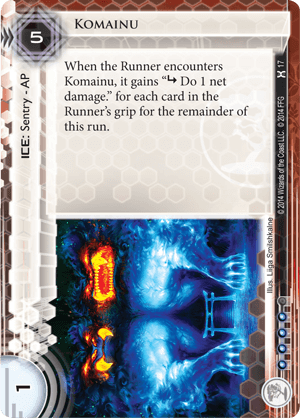 The dynamics of Netrunner ensure that if you take several turns off without pressuring the Corp, you will lose. Once you’ve got two Pawns online, you can start running profitably. Note that the first Pawn promotion will fail to bring back anything, so you can trash the first Pawn from your grip or use it to Scavenge something back into play (say, SMC). Also note that Pawn promotion can install from your Grip, which is handy if you draw into the third Pawn naturally. Archives will probably be lightly Iced at this point, so take advantage of this by making free runs on it, with Dirty Laundry if you have it. Use the free card draw to further develop your rig, adding the third Pawn and Datasuckers as you find them. Parasites can open up servers to cheap runs. Clone Chip can bring back Parasite mid-run, with Datasucker backup allowing you to instantly kill a piece of Ice just as it gets rezzed. Atman on 0 can act as a wildcard breaker as long as you have enough Datasuckers. Your goal is to make economical runs; if there are no avenues to do that, dig for tools until you find a way to make it economical again. Test Run, Clone Chip and Scavenge can all bring back Parasites in order to trash Ice. Femme a Tollbooth. Atman on 4 gets you past Lotus Fields. 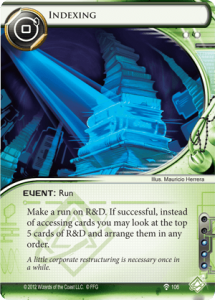 Once you find Indexing, your main priority should be to setup a turn where you can run R&D 2+ times for points. Between your two Indexings and random accesses on HQ and R&D, you should find 7 points of agendas. It’s not unusual for this deck to go through its entire stack; once you’ve done so, you should be able to take on anything, if you haven’t won already. I’m your main win condition. Play me one turn one if you can get away with it. Pawn’s primary predator is Blue Sun. Whenever one of you Pawns is hosted on a rezzed piece of Ice at the end of your turn, Blue Sun gets the option to bounce that Ice, trashing your Pawn. While all Corporations can and will trash your Pawns, Blue Sun can do it over and over at very little cost to themselves, making it virtually impossible to keep the engine going over the entire game. It’s still worth going for the engine (because it’s half your deck) but you shouldn’t waste all your recursion on maintaining the Pawns. Watch as I trash your Pawns at no cost other than an install. All your non-Parasite Programs will be installed on Scheherazade, so anything that threatens to trash it can end the game for you in a hurry. An unexpected Power Shutdown for 0 will sink you if you have no installed Pawns, so keeping Inti around is a good idea. Destroyers and pseudo-Destroyers (Inazuma, Merlin, Galahad) should be avoided like the plague. I may grant a program-trashing subroutine, but I don’t grant the Destroyer subtype! Sharpshooter won’t save you! 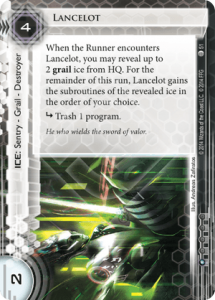 Glacier decks that can stick multiple layers of taxing Ice on their centrals can slow down your engine tremendously; if all centrals are stacked three deep, you’ll get to draw 2 cards and get 2 credits for every three runs you make, neutering your efficiency. Rush decks are bad for you, though you have tools for dealing with them. If the Corp goes for a turn two install Advance Advance, you can always delay your combo and go for the “Shaper Inside Job” (Test Run for Femme) or run into it with SMC, fetching up whatever you need mid-run. 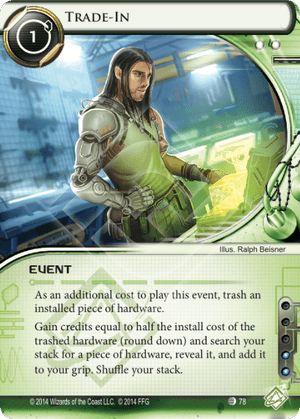 Still, against any deck that plans on winning the game quickly (Hello, NEH Fast Advance), it’s unlikely you’ll be able to assemble your engine. This is the core combo, and none of the cards here are even slightly negotiable. We’d run 7+ Pawns if we were allowed to. Running anything less than 3 Deep Reds is a mistake; we have no way to tutor for them, and heaven forbid we hit a Shattered Remains or Taurus. 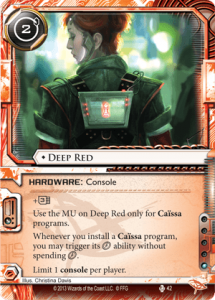 3 Deep Red gives us a ~30% chance of seeing them in the opening 5, which means a ~51% of getting it if we mulligan for it. Even if we brick on both mulligans, we have a ~75% chance to find it after digging through 8 new cards. Of course, this means that in one game out of four you’ll look at a whopping 18 cards and fail to see a single Deep Red. Do you really want to make those odds worse for yourself? I’ll talk about this card in a minute, don’t worry. This card is insanely good in any Shaper deck, and here it triggers the Exile ability to boot. Never cut this. This enables your toolbox strategy, gives you incredible redundancy and triggers the Exile ability if you install from Heap. Never cut this. As with Test Run, but this comes with incredible Scheherazade synergy. The two Scheherazade installs you make with this pay for the tutoring cost, turning this into a 0-cost program tutor. Never cut this. Sure Gamble is a good card. Never cut this. We need economy; click-light economy that you can fire and forget, since you want to spend clicks running for Pawns. Never cut this. As Daily Casts, this even includes a run. You have not tasted value until you Dirty Laundry and get back 7 credits, 2 card draws and 3 Datasuckers. Never cut this. Scavenge is a fairly narrow effect but a useful one, recurring whatever program we need at the cost of one we currently don’t. Exile’s card draw goes a long way to making this more economical. We’d like 3, but it can often sit dead in your hand as you search for your combo pieces. You can’t just use it as soon as you draw it and need to wait for a good opportunity, so 2 copies is appropriate. As terrible as I feel cutting an Indexing from the deck, I think it’s correct. Indexing is a grossly powerful effect, punishes an undefended R&D like nothing and costs 0. It is the Shaper Account Siphon in all but name. That being said, a good Corp player will heavily Ice R&D as soon as they see a green Identity; you will not get free R&D accesses outside of the most dire circumstances. As such, Indexing occupies a space similar to that of Scavenge; it’s a strong effect and we’d like 3, but it’s not useable at every stage of the game. It will gum up your hand as you try to set up (never trash it!) and because of that we run 2. 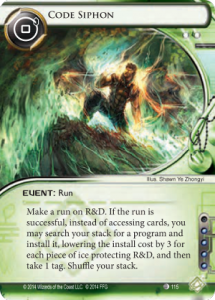 The decklist above runs 3 Chips, but you could likely get by running only 2. Sadly, our console does nothing to help with our memory situation (Pawns take 0 memory) and so we need dedicated card slots for memory. Between Datasuckers, SMC, Parasites and our various utility program, the baseline 4 memory does not cut it. Akamatsus are the best choice for the job; they’re cheap on credits, which goes well with our plan to draw a lot of cards. 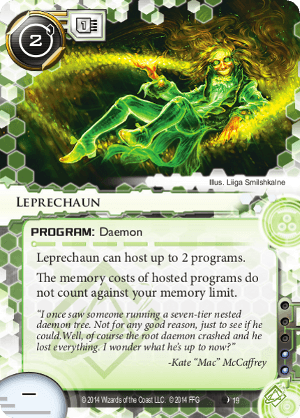 I would love to run this card if it weren’t for the massive anti-synergy with Scheherazade. This is your toolbox of programs, situational tools that can be devastating in the right context. Given how much tutoring and recursion we play, these cards are usually available whenever they’re needed. While Parasite has anti-synergy with two key cards (can’t install it on Scheherazade, don’t want to Parasite Pawned Ice) it is itself a key card. 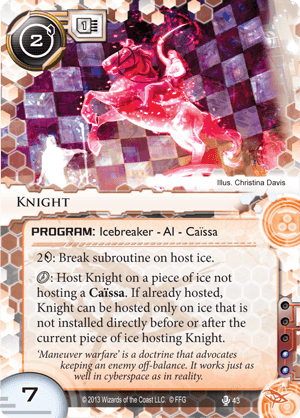 Keeping servers Ice-light is crucial to this deck’s purpose, and Parasite is the best way to achieve that. Between Test Runs, Scavenges and Clone Chips a single Parasite can be used up to 9 times, but it rarely comes to that. Never cut the first Parasite. We’re already running 3 copies of Test Run and Scavenge is a natural inclusion for us. Thus, the value of Femme goes way up. It answers Tollbooths and can be a perfectly respectable Killer with Datasucker backup; you’d need a very strong reason to cut this. Recurring Deus X makes the Jinteki matchup tolerable. While you won’t get much use out of it against other factions, it is a key card against PE. Without it, you run a very serious risk of running out of cards in your Stack given our aggressive card draw. Destroyer insurance. We’d prefer Faerie, but this is what we have in-faction. Even if you don’t run the full Atman-Datasucker package, a single Atman is still a strong inclusion in your Toolbox. SMC-ing up a surprise Atman can break servers wide open, render taxing Ice impotent and steal games. 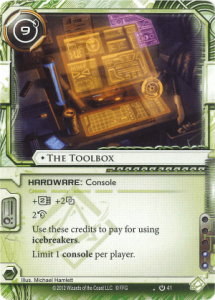 “Toolbox” is a card game term used to refer to a set of easily tutored one-ofs. Don’t play an actual Toolbox. This might be the more contentious inclusion; I chose to go with an Atman suite instead of traditional breakers. 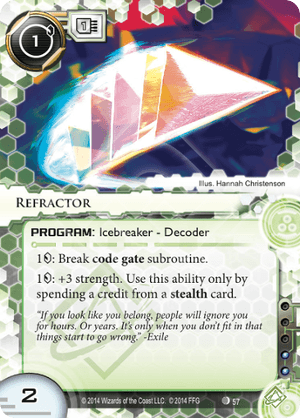 Atman and Datasucker synergize naturally with the deck’s strategy of making many economical runs; Atman does not need to be pumped for each run, which makes most Ice cheap to break. Datasucker thrives on successful runs and provides the extremely powerful instant Parasite. We’re already running 1 Atman as part of our Toolbox, so this is just rounding out our set of three. You could cut one if you really wanted to, but Atman isn’t something you want to tutor for; you certainly don’t want to Test Run for it, and there’s enough stress on SMC as it is. A typical rig will want Atman-0 and Atman-4 (Lotus Field). Playing only 2 would be cutting it close. Atman’s enabler, and quite synergistic with the rest of our programs (Parasite, Inti, Femme). You could make a case for running only two if you desperately needed the influence, but I just don’t see it. You want at least two of these active, and you usually don’t want to tutor them up. Please don’t try to run the Stealth breakers in this deck. Add up all the previous packages and you’ll get 42 cards, 13 influence. Those are the “indispensable” cards of the deck; the last few slots are a bit more malleable, and there’s a lot that could go in them. Feel free to experiment with these. The third Mem Chip is a good place to start; 7 memory will get you 3 Datasuckers, 2 Atmans, a Parasite and one of Deus X, Sharpshooter or Femme. You cannot really go wrong playing a full set of Mem Chips. Yeah, just one. Our Blue Sun matchup is horrid, and you could be forgiven for simply giving up on improving it. 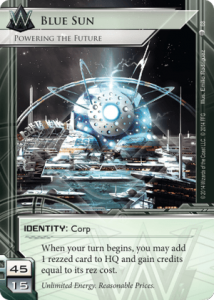 But with Order and Chaos on the horizon, Weyland will become much more popular outside of Blue Sun. Just the one Plascrete gives us outs to situations that would otherwise be unwinnable; Once Weyland assembles a SEA Source, two Scorches and a credit lead, you cannot run anymore. The one copy of Plascrete gives you an out; dig for it, installing Daily Casts as you go. Finding it makes double Scorch not-quite-lethal and lets you get back in the game. We’re already running one; why the second? Because it is just that good. Of all the 2-influence options we could play, Parasite redundancy is the strongest one. It enables our strategy in a major way and it is always strong. What about me? You’re already running Deep Red! And Pawn can recur me! Any program tutor is worth a second look. While I don’t think this will outshine Test Run or SMC, the added redundancy could be interesting. The obvious problem is that no Corp will give a Shaper unfettered R&D access, and thus we’re unlikely to get much use out of it when we need it the most (in the early game). There are so many cards that I would like to fit in the deck, but the 45-card deck size is a cruel, optimal mistress. If you’re running anything over 45, you can always cut your worst card to make your deck better. Levy AR Lab Access: This is a mental crutch. “But what if I run out of cards in my stack!” Then you’ll have to win with the cards you have in play already. LARLA is a dead card in 99% of games; here, it even kills your Pawn engine. There’s no reason to run it other than for the illusion of safety. Escher: Unlike LARLA, I really wish I could find room for this. It’s often a dead card, but when it works, it blows games wide open. Stacking two Tollbooths on a worthless server and making R&D wide open is about as strong as plays get. Escher gives this deck more teeth against a porous HQ, which it has none other than Datasuckers. In the end though, it’s so situational a card that it had to be cut for the sake of consistency. 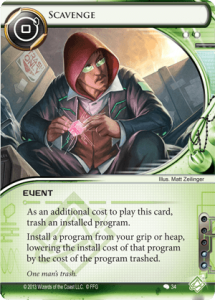 More copies of Scavenge, Indexing, Plascrete: This is purely down to deckspace. You can tweak the numbers around if you like. Diesel: A Shaper staple and a useful card to have when digging, Diesel was cut for not being part of the core engine and being largely useless once the engine is online. More copies of Scheherazade: You’d be more likely to draw into it naturally without needing to blow SMC, which would be sweet. The later dead draws are slightly less sweet. In the end, influence is tight, and SMC gives you 4 virtual copies. Imp: Oh, the things Imp would do for this deck. Trash operations out of HQ (like Scorch!) Trash those taxing assets that kill our fledgling economy. Get recurred over and over with Scavenge and Clone Chip. Get Scavenged once empty. But that influence cost! We’d have to lose a Parasite and a Datasucker. Try it. It might be worth it. 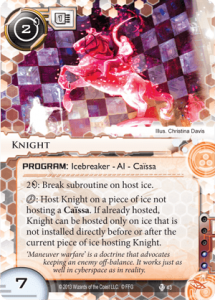 Knight: The only Caïssa worth considering, it certainly looks good on paper. But what are you trying to achieve with Knight? We don’t want to spend 4 credits getting through Enigmas to steal Agendas or land Account Siphons. We want to make economical runs, and Knight does not enable economical runs. Even with a zero-memory cost and a free hosting, Knight is the wrong card for this deck. Plus, you can’t Knight Ice that is already Pawned, which is just awkward. Escher, the quintessential 46th card. Do you want to perform five actions in a single click? Do you want to have an arsenal of options for dealing with Ice? Or do you just want to savour your opponent’s confusion as he picks up Pawn to read it for the first time? Maybe you just enjoy the irony of running 6 Caïssa support cards with no business Caïssa, subverting their intended purpose and using them simply as junk programs to shuffle around. Or maybe you really want to play a good Exile deck. There aren’t many of those. And that is all for today. Next week we’ll go back over to the Corp side for another deck. Feedback is, as always, highly appreciated. If you have any suggestions for deck archetypes you’d like to see me discuss, email me at Nagnazul@gmail.com. Until next time, keep on running, and keep on moving Pawns around. Caissa, Chess, Deckspace, Exile, Pawn, Street, Street Chess.